This comes after an earlier announcement that Honda and Acura vehicles will feature “Level 3” highly-automated freeway driving capability by 2020. Honda says both targets are crucial to the automaker’s goal of contributing to a collision-free society. Honda CEO Takahiro Hachigo made the announcement at a media briefing held at Honda R&D in Japan, where members of the press were able to test drive Honda automated vehicle technologies, including systems with advanced artificial intelligence (AI), in several different driving scenarios. 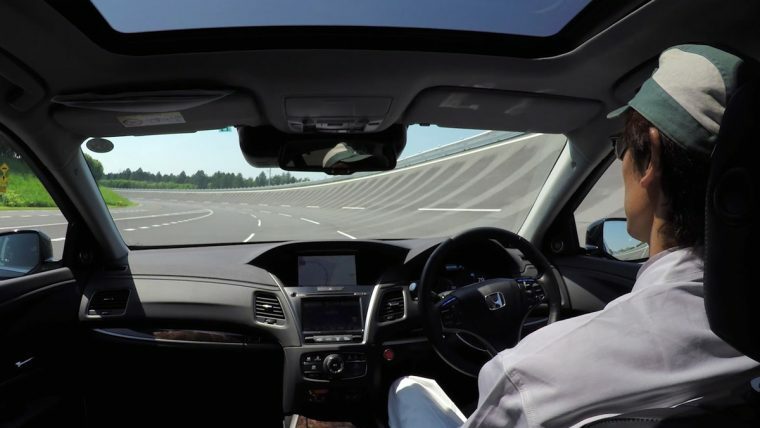 Honda performed its freeway driving test-drive demonstration on a closed test course with a vehicle equipped with an advanced suite of sensors, showing off the automated driving system to navigate a multi-lane freeway in the midst of traffic. The vehicle’s suite of sensors included multiple cameras, along with five LiDAR and five radar sensors. In another demonstrated driving scenario, Honda recreated a common urban driving experience by using a vehicle equipped with the latest generation of Honda artificial intelligence (AI) with Deep Learning capability, which uses camera sensors only and no LIDAR or GPS to detect and respond to cues such as road markings, pedestrians, and bicyclists at night. The SAE has defined automated driving based on six levels of capability, with Level 4 being “high automation,” meaning that the vehicle can handle all driving tasks in most driving situations, possible exceptions such as inclement weather conditions or unusual driving environments not withstanding. In such cases, the driver would be alerted and forced to resume control of the vehicle.